The Los Angeles International Textile Show is right around the corner and my office is filled with fabric headers for my textile trend stories. (The first appears in today’s issueand more are coming next week). 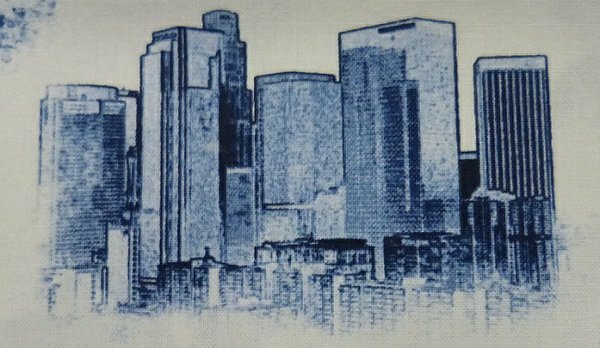 It’s part of the company’s Urban Toile series and features sights of LA, including the downtown skyline, the Hollywood sign and a food truck offering Korean barbecue. There’s also a version for die-hard New Yorkers with scenes of the Brooklyn Bridge, the Statue of Liberty and a taxi cab. The print is similar to one I spotted last June in a New York Times slide show of the Brooklyn home of Michael Diamond–a.k.a. The Beastie Boys’ Mike D. He designed his version, dubbed Brooklyn Toile and had it made atFlavor Paper.